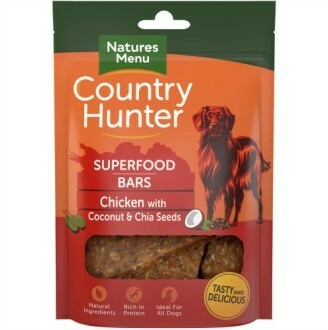 Superfood bars use quality chicken pieces and a natural blend of coconut and chia seeds plus other wholesome vegetables for a nutritious and rich in protein snack. Gently air-dried to lock in all the goodness and flavour from our natural ingredients. Each bar has an abundance of wholesome vegetables, superfoods and minerals including spinach, sweet potato and thyme for a deliciously healthy treat. We only use quality, human grade meats in natural pet foods, and absolutely no meat meals or meat derivatives.